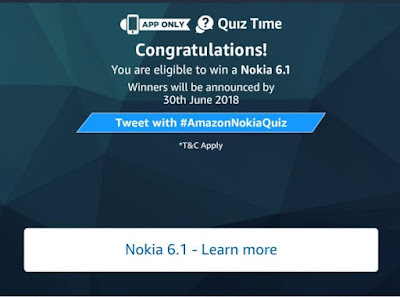 Amazon Nokia 6.1 Quiz Answers:- Hi Guys, Hope You are Doing Wonderful Nowadays With This Rainy Loot Season, Amazon Is Back With Another Quiz & This Time Reward Is Nokia 6 Android Smartphones. Yesterday We have Posted The Amazon App OnePlus 6 Quiz To Win OnePlus6,& Hope Most Of You Have Participated in it To Try Your Luck, Here are Another Similar Types Of Quiz To Win The 6.1 Nokia 6.1 Smartphones. There are a total of 11 (Eleven) Prize(s) that will be given under this Contest. The Prize will be delivered to the winner on or before 30th July, 2018. 2. The Nokia 6.1 runs on __, which ensures it gets regular security and OS updates. 5. The draw of lots will be carried out during the Contest Period for the questions and a total of 11 (Eleven) participants will be selected as winners by a random draw of lots. A total of 11 (Eleven) participants will be selected as winners of the Contest. 6. The declared winner(s) will be eligible for winning a Nokia 6.1 device each (hereinafter referred to as “Prize(s)”).